OVERVIEW Cape May Cafe has been a favorite for years because of its consistently good food and efficient service. The restaurant is large and tables turn over rapidly, but reservations are recommended. A walk-up request for a table for three at 9:00 a.m. on a Sunday morning required a 48-minute wait to be seated. 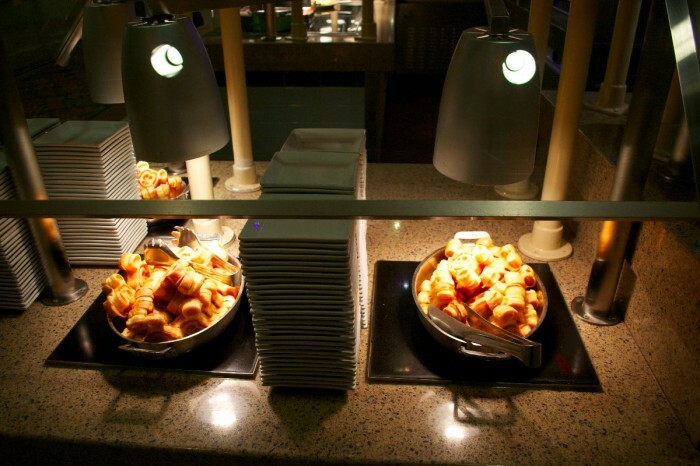 The Cape May character breakfast buffet is known for specialties like Chorizo and Four-Cheese Scrambled Eggs, cold salmon, and cranberry and banana breads. MENU Click HERE for the full menu. Yogurts, fresh fruit, low-fat cottage cheese, hard-boiled eggs, capers, and more. Scrambled eggs, Chorizo and Four-Cheese Scrambled Eggs, bacon, sausage, home fries. French toast with caramelized bananas and other offerings. Pastry selection with whipped cream and strawberry sauce. 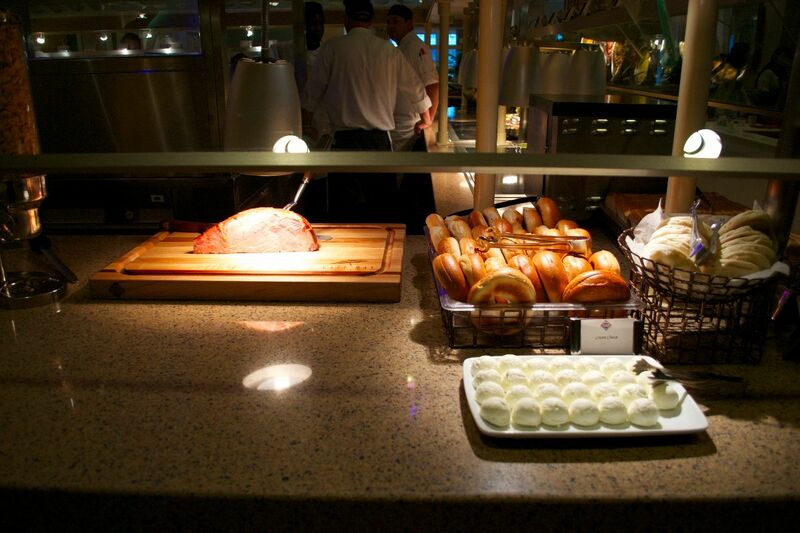 Carved ham, bagels, and cream cheese. 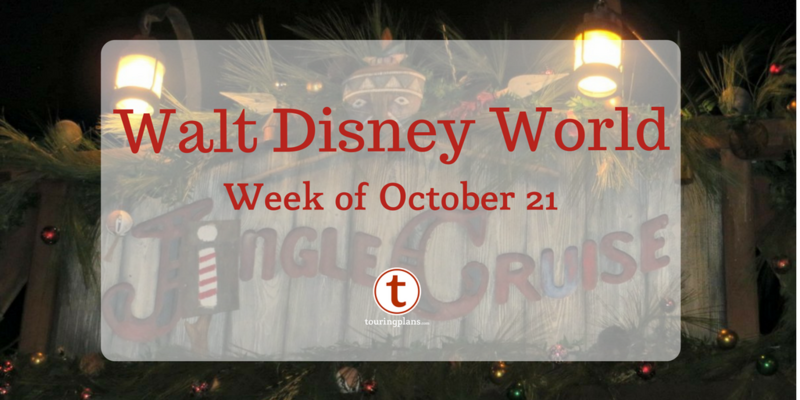 Standard family-pleasing fare will make just about any guest a good meal, and the children’s offerings include Mickey Waffles with strawberry compote and assorted cereals. 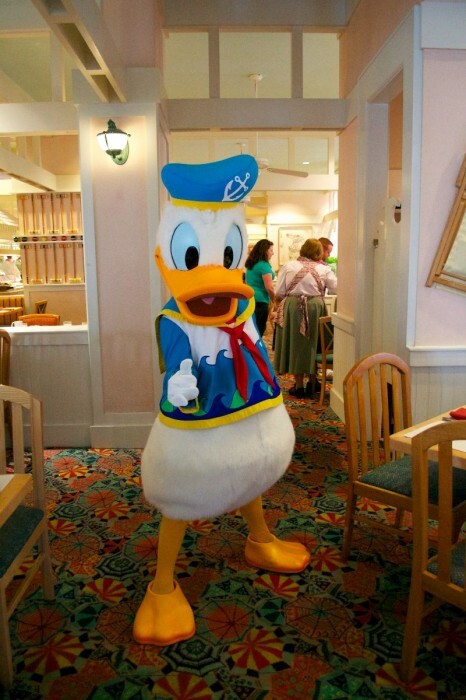 Cape May’s character breakfast buffet is a tamer alternative to Chef Mickey’s in that it can be less crowded and a bit less noisy, but only 3 of the Fab 5 Characters appear at this character dining experience. Price: $24.99 Adult (10 and over) Breakfast, $13.99 Child (ages 3-9) Breakfast; Note that prices vary seasonally. What are the best places to eat on the dining plan where my kids won’t get cheated with a high carb no quality meal? I haute that the dining plan is going to force me to feed them on a week where they need good fuel in a way u would never normally feed them. 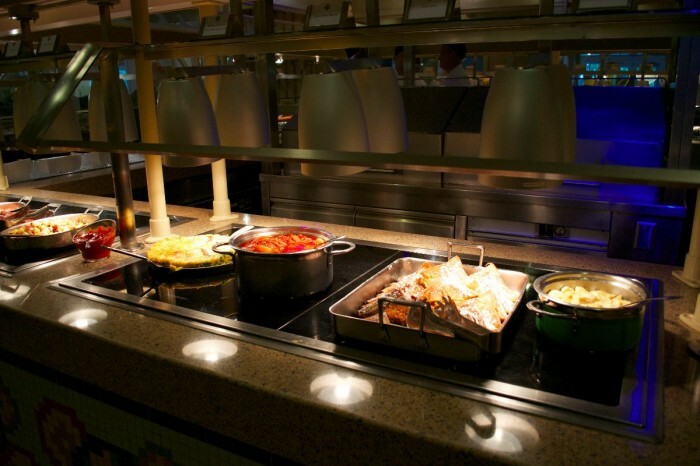 The dining plan is probably not a good value for anyone wanting a low carb diet while on vacation at WDW. In my experience, there are fruit and veggie options everywhere (usually salads at counter service restaurants), but you won’t get a good value if that’s all you’re eating. Disney doesn’t shoot for low carb, but they do have choices that ARE. The choices will get pretty repetitive, pretty quickly. 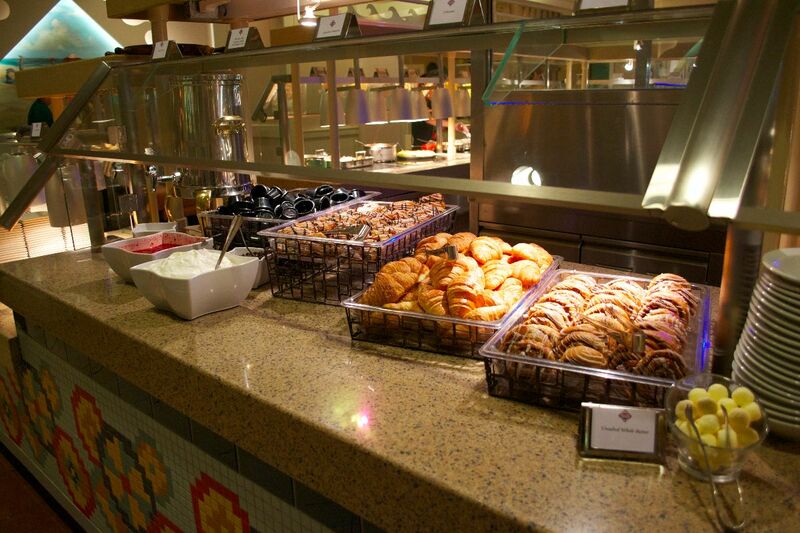 At the buffets, if you’re only eating low carb choices, you’ll find limited selections. 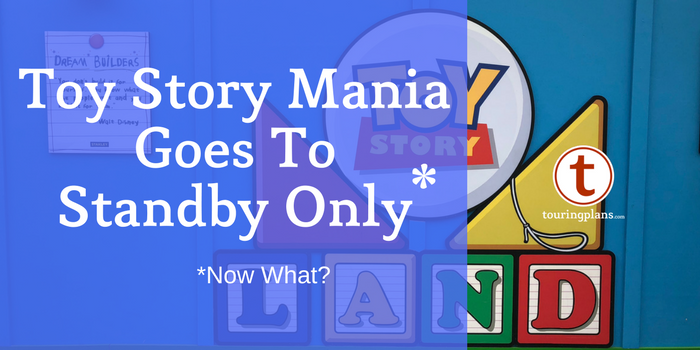 Disney’s great about dietary restrictions, but that doesn’t always mean there’s a lot of variety available. That’s especially true for the buffet restaurants. There WILL be low-carb choices, but they will repeat a lot. If you’re paying for the dining plan, I’d say it’s not worth it if you only want to eat healthy/low-carb stuff. If the dining plan is free, then it’s not as big a concern, value-wise. It might be worth considering a week of free pass eating, if the low-carb diet is a lifestyle, rather than a medical, choice. You dont need to buy the dining plan. (unless its free) We do better out of pocket. We do not do desserts with every meal. We sit down for one meal and counter service eavery day. But some times we opt for an appetizer instead of a whole entree. Hi Denise. I understand your question as it relates to the kids’ menus. 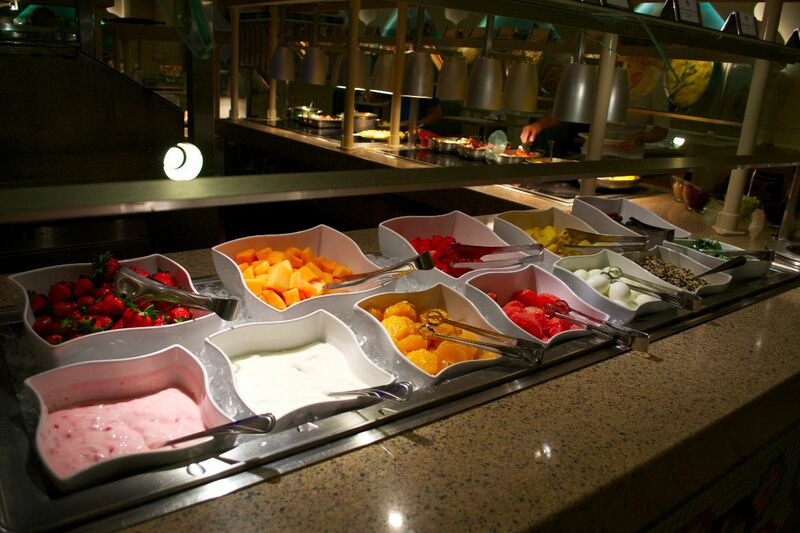 Of course the buffets are always going to give you a better selection when it comes to healthy choices. 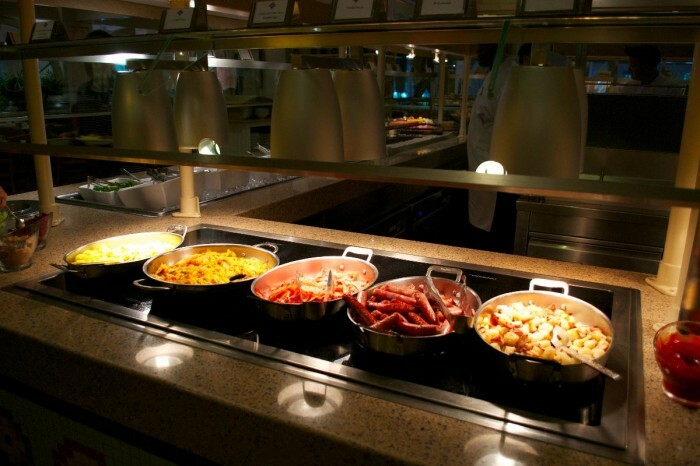 The Chorizo scrambled eggs on this particular buffet are delicious, as is the ham. Some of the kids’ meals at Disney have recently undergone an overhaul that Disney classfied as “mickey check meals”. They include lean proteins, steamed vegetables, and often brown rice or quinoa. While they’re certainly set up to be healthy, they’re occasionally not very tasty. I’d give them a shot and see if your kids like them. The dining plan isn’t economical for my family. We can only get our money’s worth by binge-eating at character meals, and we only attempt that about once per vacation. Can you eat healthy? Sure, but if I were to indulge in oatmeal, muffins and fruit, I would be very disappointed knowing that my healthy m and I know we are getting plenty of exerciseeal as paid by the dining plan really cost me $14-18 (depending if it gets billed as a single quick service credit or QS plus a snack creodit). Personally, I find it easier to eat healthy at lunch and dinner at WDW. My family likes the unhealthy fat-and-carb-loaded breakfasts. 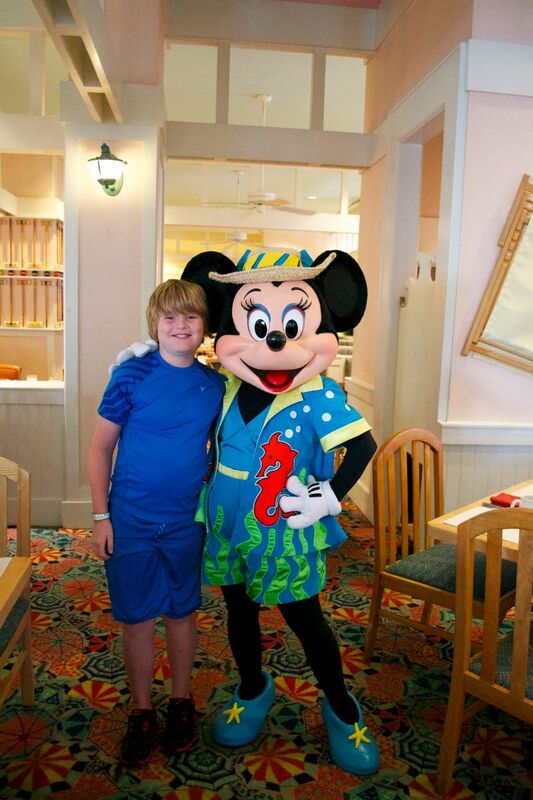 But I will only pay for Mickey waffles one or twice per vacation. McDonald’s serves similar quality breakfast combos for 1/3 the price, so I feel less guilt about breakfasting there on vacation. And we eat small yogurt / cereal / muffin breakfasts in the hotel room on days when we are planning large lunches. Sorry about the cut-and-past error in the 4th sentence. Trying to fix…. Macerated berries on French toast or Mickey waffles with a drizzle of maple syrup! Yum. Hubby loved the pastrami-style salmon and interesting cold-cut options. This is a great place to have breakfast. 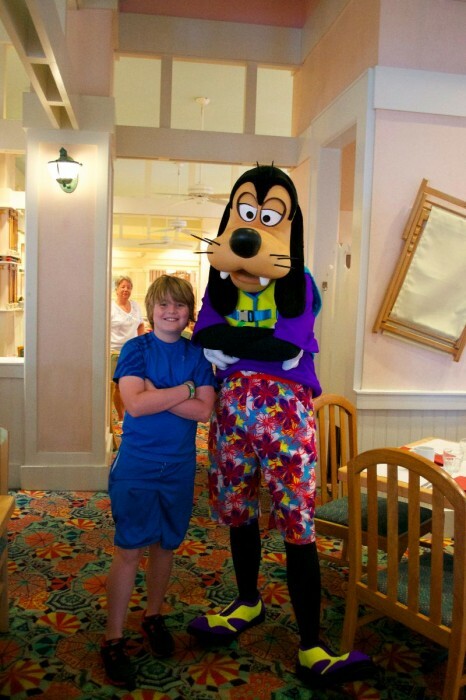 Cape May Cafe was our family’s first character dining experience on our first trip to WDW. We really had no idea where to go, or when to make reservations, and by the time we got around to making reservations the Cape May Cafe seemed to be our best choice. We weren’t disappointed. The food was excellent and the service was outstanding. And there is no mistaking the pictures we took that morning because the character outfits there are garish (to say the least!). We took the boat from the Epcot International Gateway over to the Beach Club Resort to make a bit more of an event out of it.